By Thine own Blood, O Savior, Thou hast ransomed mortal men, and by Thy death Thou hast delivered us from bitter death, granting us eternal life by Thy Resurrection. Give rest, then, O Lord, to all those who have fallen asleep in godliness, whether in wilderness or city, on the sea or land, in every place, both princes, priests and bishops, monks and married people, of every age and line, and count them worthy of Thy heavenly Kingdom. Why do Orthodox Christians pray and give alms for the dead? This has been an ongoing and uninterrupted practice from the earliest centuries of the Christian Church. Death does not destroy the bond between Christians. On the contrary, as the Scriptures say, “Love is strong as death.” (Song of Songs 8:6). That is, the bond of agape between Christians overcomes the limits of death. For the Christian, “death is no more.” Therefore, just as we are united by the bond of prayer on earth, so all the more should we unite ourselves by the bond of prayer to those who have gone to the life in the other world. We know from the testimony found in the Lives of the Saints and the writings of the Fathers that the prayers and alms of the Church help those who have gone before us. Do the prayers of the Church really help the departed? “The Partial Judgment, to which all men are subjected after death, is by no means complete and final, wherefore it naturally follows that they await another, complete and final judgment. During the Partial Judgment, only the soul of man receives its retribution, not the body as well, even though the latter shared with the soul its deeds, good or evil. After the Partial Judgment, the righteous in Heaven and the sinners in Hades have only a foretaste of the blessedness or punishments which they deserve. Finally, after this Partial Judgment some of the sinners will be relieved of the burden of the punishment and will be completely delivered from the sufferings of Hades, not through their own action, but through the prayers of the Church.” (from The Oecumenical Synods of the Church of Christ, by Met. Nektarios [Kephalas], p. 222). Exactly how our prayers help the departed faithful is unknown to us; it is a mystery of God’s providential care for man that we dare not pry into. But that the prayers of the Church, especially the Divine Liturgy, help the departed, was never questioned by anyone for the first 1,500 years of Christian history! “St. Grigorios Dialogos (St. Gregory the Great) also tells how, in the time of Osios Venediktos (St. Benedict), there were two women who excelled in fasting, but, although they had a reputation for the holiness of their lives, they had an unfortunate passion for talk and used to say much that was untrue and harmful. The saint begged them to restrain their tongues, and, when they disobeyed, he even threatened to excommunicate them. But their passion for lies had taken so deep a root that even threats did not stop them. A few days later they died. These fasters were buried in a church. When, during the Liturgy, the deacon would say, ‘Catechumens, depart!’ they, since they had been excommunicated, would get out of their tombs and go out. Some pious Christians saw them doing this. When the man of God had been told of this, he sent a prosphoron (altar bread) to the church where the women had been buried and ordered that a part of the bread be taken out for their souls. After this, no one saw them again leaving the church, and the faithful understood that their prayers for the dead women were pleasing to the merciful God, Who then forgave them.” (account found in Dialogue II of St. Gregory the Dialogist [Gregory the Great, Pope of Rome, +604]). Isn’t this the same as the Roman Catholic teaching about “Purgatory”? The Roman Catholic idea of Purgatory is that the departed sinners are cleansed of their sins by their own temporary sufferings in a temporal, cleansing fire after death. In the Orthodox teaching, suffering after death cannot help the departed soul – the time for cleansing sufferings is this life, not the next. The departed soul cannot help itself – only the prayers and alms of those still in this world, that is, the loving sacrifices of members of the Church on earth, can help! The teaching on Purgatory is part and parcel of a rationalistic, systematized teaching on merits and indulgences which is foreign to the mysterious and evangelical spirit of Orthodoxy. In Orthodoxy, how prayer and sacrifice help the dead is a profound mystery of God’s mercy to man and the power of man’s love for his fellow man, not a clear-cut system of God’s justice and man’s merits. How do we pray for the dead? There are two types of prayer for the dead: public and private. Public prayer for the dead consists primarily in the offering of the Divine Liturgy and the Memorial Service. The Divine Liturgy: At every Divine Liturgy, the Church offers the one Sacrifice of Jesus Christ, which takes away our sins and gives us eternal life. This is an infinite and priceless gift, which Christ has bestowed on us by suffering His terrible passion and death, and rising from the dead on the third day. We can and should frequently give the priest lists of names of our departed faithful to remember at the Proskomidia, when particles of the prosphoron are taken out for the living and the dead. This should always accompany a prosphoron we bake and offer, but we can send lists of the names of the departed into the altar any time (before the Great Entrance). Private prayer for the dead consists primarily in reading the Psalms, as well as “saying prayer ropes” and making prostrations with various short prayers. Reading from the Book of Psalms (the “Psalterion”) is a most ancient and praiseworthy way to pray for the dead. Before we start reading, we simply say, “Remember, O Lord, the soul(s) of Thy departed servants (name or names),” and then we open the book and read. Any of the psalms in any order are fine when reading privately, but Psalms 50, 90, and 118 are especially appropriate in reading for the departed (if you are reading from a Protestant Bible like the King James, these are numbered as Psalms 51, 91, and 119). Should we pray for the non-Orthodox who have died? We certainly should pray for those departed outside the Church, especially our relatives, friends, teachers, and benefactors! The only qualification is that we normally only offer private prayer for the non-Orthodox, while we offer both private and public prayer for the Orthodox. If we will stop and think about this for a minute, it makes sense: The non-Orthodox are those who, in this life, never publicly declared or accepted the fulness of our Faith. We cannot do violence to their religious choices in this life by pretending after their death that they shared our faith. But they may have, in private, been pleasing to God in a way we do not understand, for it has not been revealed to us. Therefore, we pray for them in private. When should we offer Memorial for the Orthodox Departed? Saturday, the Seventh Day, is the pre-eminent day for the commemoration of those who have reposed, because it is the day on which the crucified and buried Christ slept in the tomb in the body, while His soul went down to Hades and freed those held captive there. Thus, it is fitting that on this day we remember those whose bodies sleep in the grave and whose souls are either in Paradise or Hades, awaiting the Dread Judgment at the Second Coming of Christ, when the Lord will resurrect the bodies of all men and judge every man according to his works, assigning each one of us his place for all eternity. By contrast, Sunday, the First Day of the Week, is the Day of the Resurrection, not the day of the sleep in the tomb before the resurrection. Sunday symbolizes eternity, which will begin after the Dread Judgment, when prayers for the dead will no longer be possible, because all will have received their final recompense with no possible change thereafter. This is why the holy canons properly forbid memorial services on Sunday, which we perform only by oikonomia (“economy” – a bending of the rules for pastoral reasons). We do not sin in offering memorials on Sunday, but it is better to offer them on Saturday, or other days of the week. Yes, it requires extra effort. Yes, it means that our friends and relatives have to give up their Saturday chores, errands and entertainments to come. This is exactly why we should do it. The greater our sacrifice, the greater the grace bestowed. What is the significance of the 3rd Day, 9th Day, and 40th Day after death? According to Holy Tradition, the soul of the departed person normally remains on earth from the day of death until the third day. From the third day until the ninth day, the angels take the soul and show it the mansions of Paradise and Heaven. From the ninth until the 40th day, the soul is shown Hades. On the 40th day, the Lord pronounces a Particular Judgment for this departed person, assigning the soul a place in Paradise or Hades to await the Second Coming, the General Resurrection, and the Dread Judgment. Thus we should arrange for the Divine Liturgy and/or Memorial to be served in our parish church on the 3rd, 9th, and 40th day of death for our beloved departed. (The complete funeral and burial service is normally performed on the 3rd day, following the Liturgy). We should also contact monasteries, cathedrals, and other places where the Liturgy is offered daily, and ask that the soul of this person be remembered every day for 40 days. Normally, of course, we send a donation with the name. 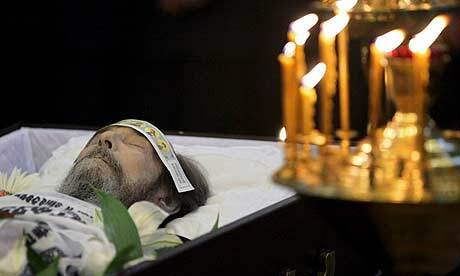 It is also important and customary to have the Divine Liturgy and Memorial on the 6th month and one year anniversaries of death, as well as on or near the anniversary of death every year thereafter. These anniversary services are normally performed on the Saturday nearest the actual date. How do we give alms on behalf of the departed? “…the blessed monk Luke had a brother who became a monk but took little care of his own soul. Death came upon him in a state of carelessness. Blessed Luke was distressed that his brother had not prepared properly for death. He therefore prayed God to reveal to him his brother’s destiny. Thereupon the old man saw his brother’s soul in the power of evil spirits. Immediately after this vision he sent some men to inspect his brother’s cell. They found there money and some other things. Luke then understood that his brother’s soul was suffering for breaking the vow of poverty, as well as for other sins. He took everything that had been found and gave it away to beggars for the sake of his brother’s salvation. Are there some good books in which I can learn more about life after death?